Gorgeous Calo des Morts beach. All photos by Malika Dalamal. 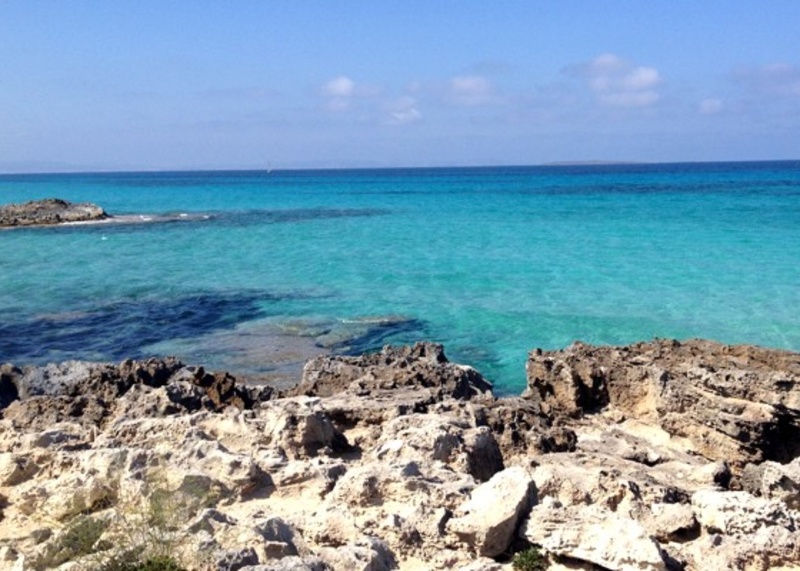 FORMENTERA, Spain – Most people who visit Ibiza will tell you the best part of their holiday was a day trip to the neighboring Balearic island of Formentera. So why not just go directly there? Because, until recently, places to stay on the tiny, understated island were few and far between. So unless you owned a boat, rented a house, or managed to bag a room in one of the few hippie hotels, it was not the most accessible destination. 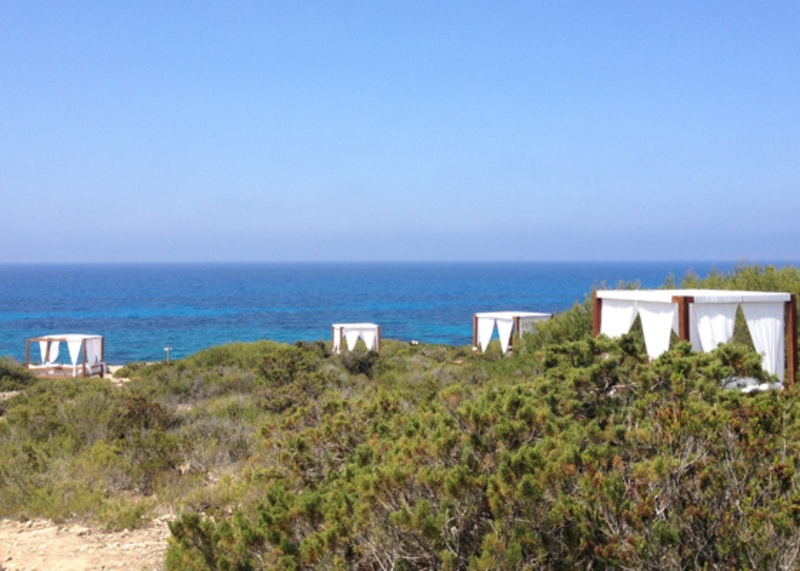 But after two months of nonstop rain in London and much late-night internet trawling, I found myself at , a luxury ecoresort tucked away on the south side of Formentera. 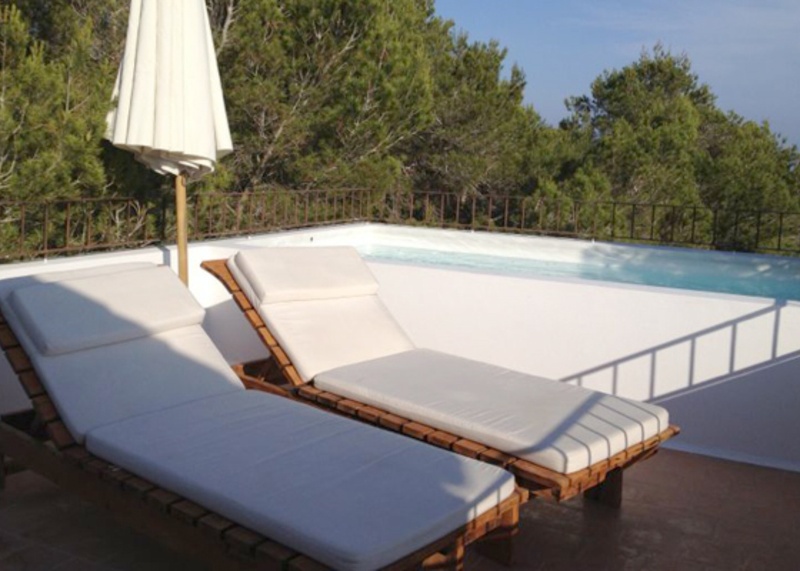 Opened two years ago by an Italian (Formentera is full of them), the heavenly hideaway is nestled among pine trees near Playa Migjorn at the end of a long, dusty road that is so bumpy it almost makes you want to turn back. Almost. When we finally arrived at the peaceful idyll, nearly losing our lunch on the road seemed completely worth it. The rustic chic hotel is made up of five white-washed villas covered in fuchsia bougainvillea and spread out on wild woodland that runs all the way down to a cliff. (More on that later.) Four of the five villas have two bedrooms, a kitchen, and have to be rented in their entirety. The fifth villa houses the hotel reception area, outdoor dining room, and seven rooms that can be booked individually, as well as a groovy rooftop lounge area where you can drink cocktails and watch the sunset. There is a grey slate pool and an outdoor gym which you won't look at twice once you discover the winding path that takes you past dreamy clifftop daybeds down to the secret fisherman's cove Calo des Morts. Here we sunbathed in peace, staring out at the picture-perfect turquoise water (no Instagram filter required) and pretended we had arrived at Alex Garland's paradise beach. 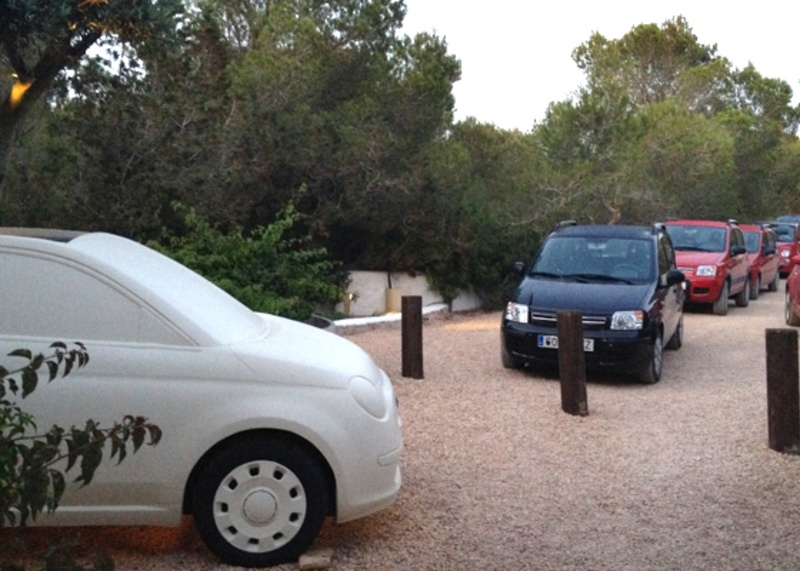 The Fiat tree on the left and the fleet of cars for guest use. Somewhat bizarrely, Es Ram is sponsored by Fiat. So in addition to branded beach towels and a strange-looking car sculpture with a tree growing out of it in the entrance, each guest is given a wonderful little car for the duration of their stay to zoom around the island and tackle the bumpy road to and from the hotel. Who needs a boat? It is nearly impossible to find a beach that isn't beautiful on the island. Go to any, and and you'll find turquoise water and long stretches of white sand reminiscent of the Caribbean. The popular choices are Playa de Llevant, Playa Migjorn, and Playa de Illetas, which is closest to Ibiza and gets busy during peak season. 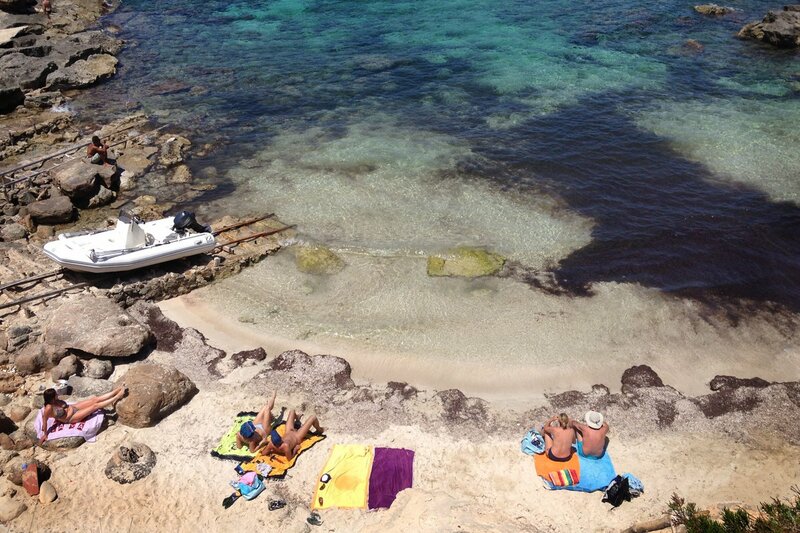 Be warned: Most of the beaches in Formentera are unofficially nudist. The artisan's market outside El Pilar de la Mola takes place every Wednesday and Sunday afternoon and is as much a cultural event as a hippie market. The atmosphere alone at this romantic restaurant in a courtyard filled with twinkling, low-hung fairy lights is worth the drive to the sleepy village of San Francesco. If romance isn't your thing, the classic Italian comfort food cooked in the outdoor kitchen is so good it's hard to believe you are not in Italy. A New York branch is rumored to be opening soon. Although it is right on the water and usually filled with diners who have arrived by boat, you need to wear shoes to eat in this seafood restaurant housed in a former mill. It's a personal favorite thanks to its stunning views and fabulously fresh food. This beach restaurant is popular with daytrippers from Ibiza who come to recover from a hard night of clubbing. Food is excellent, especially salt-baked fish and seafood paella, but at peak season the otherwise casual spot becomes a bit of a scene. The cool bar/restaurant is good for lunch, dinner, or just a drink. 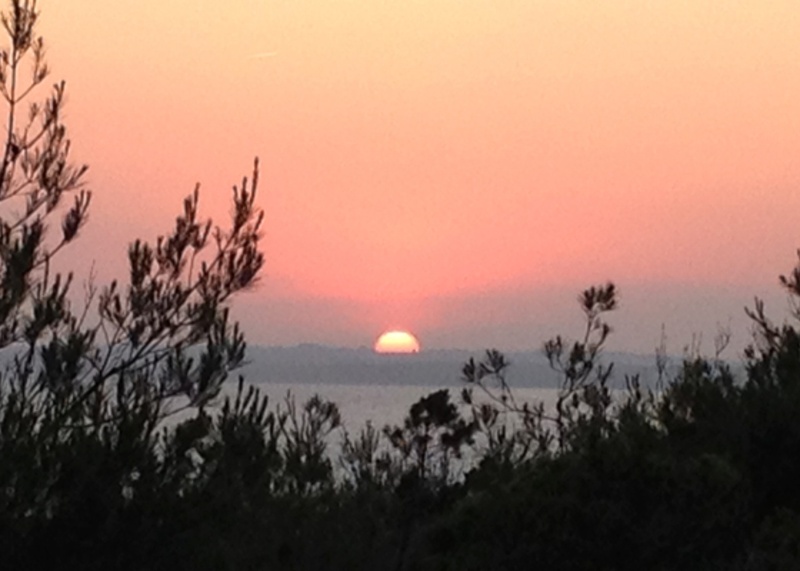 The sunset is beautiful and is conveniently located very near to Es Ram. 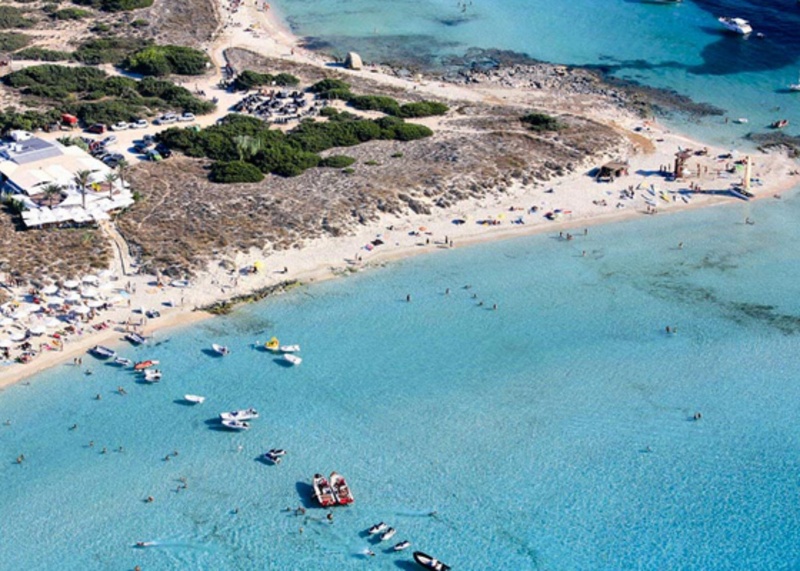 Fly: There is no airport on Formentera, so fly to Ibiza or Barcelona and take a ferry. Ferry: From Ibiza, ferries departs every 30 minutes in high season from the old port and take about a half hour. Get ferry info, schedules, and reservations from or . For ferries from Barcelona, check the schedule at .